Sometimes the best restaurants are the ones you stumble across completely by accident. 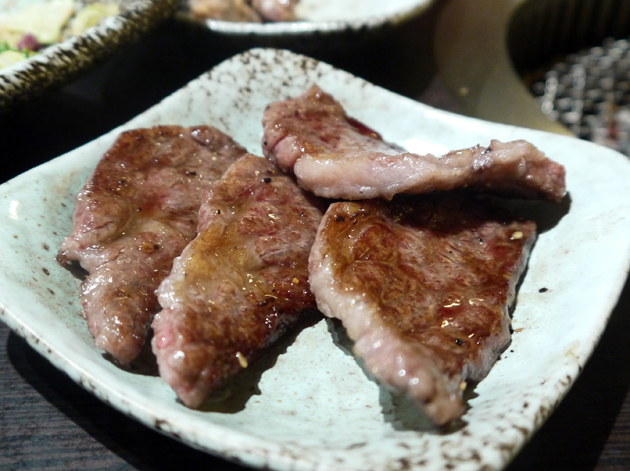 I hadn’t originally intended to visit Moe Yakiniku, a small Japanese barbecue restaurant in one of central Taipei’s backstreets, but stumbled across it after finding that my first choice was booked out. As far as I can tell Japanese barbecue is very similar to the more well-known Korean barbecue, but with fewer pungent sauces. This pleased Chip Butty no end – although she wouldn’t eat anything else in Taipei, she has an unnatural passion for Korean barbecue. 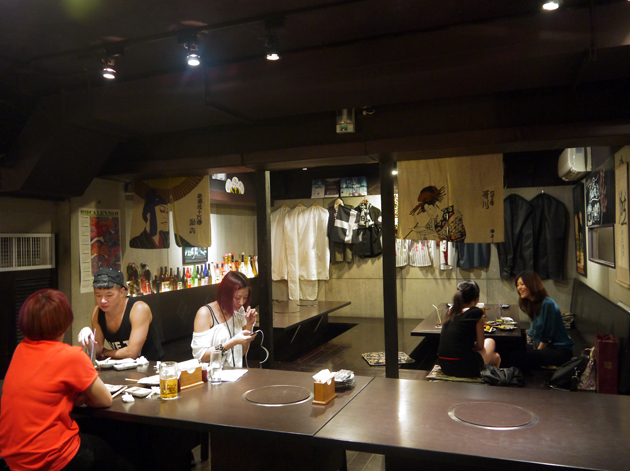 The dining room at Moe is small with room for only three dozen covers at most. The grills are set into each table and fuelled by charcoal briquettes which gave our meat a smoky tinge. Although the menu is Chinese-only and the staff only spoke halting English, they were nonetheless exceedingly polite and helped the best they could and they handled all of the cooking at our table-set grills. It almost doesn’t look like a restaurant. 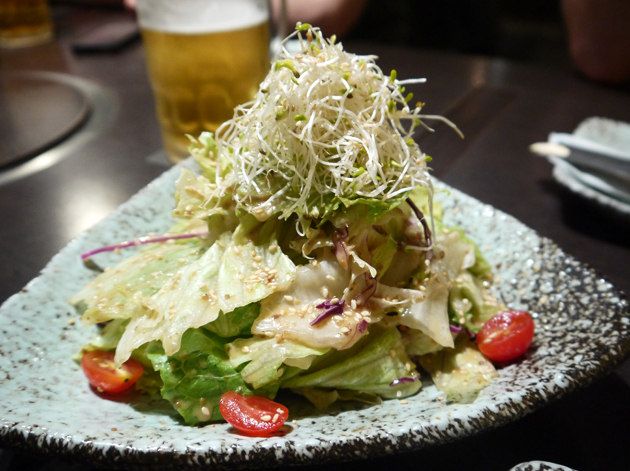 We started off with a pair of salads, both of which were quite similar with lettuce and tomatoes in a vinegarish dressing. One was topped with a pile of mung bean sprouts while the other had a small tuft of seaweed instead. Since I’m a fan of seaweed I found the seaweed salad more enjoyable, although there wasn’t nearly enough of the firm, slippery green stuff. 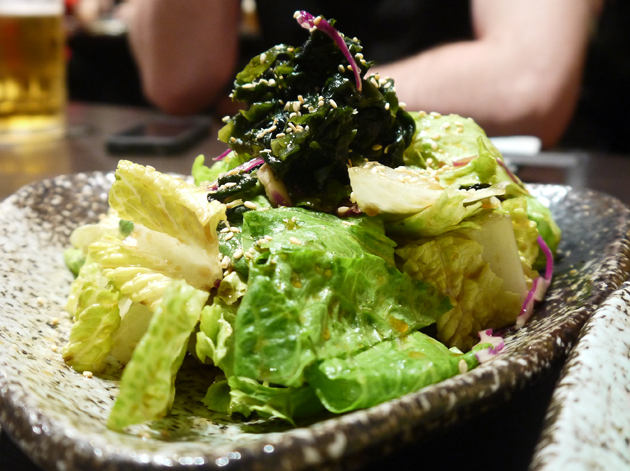 More of a salad topped with seaweed than a real seaweed salad. 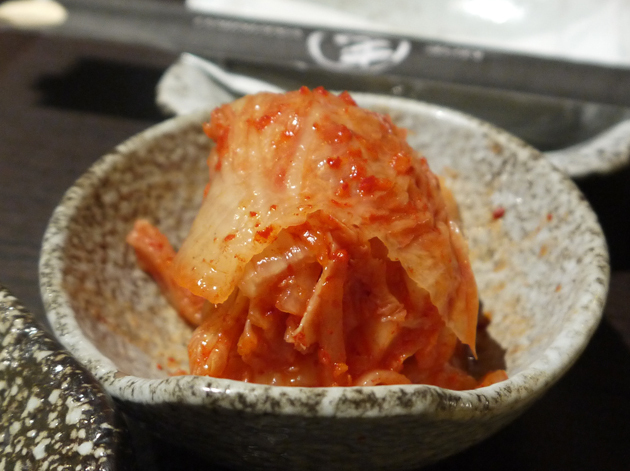 Sadly the limp kimchee wasn’t very spicy or tart. Bizarrely, despite her professed love for Asian barbecue, Chip Butty doesn’t like beef which is in keeping with her weirdly narrow tastes. That meant there was pork and chicken on the grill as well as beef. They were largely unremarkable apart from a few fatty strands of pork and some peppery bits of chicken. The real barbecue stars of the night was the beef. There are a staggering number of cuts available from American, Australian and New Zealand cattle. Although I’d like to say that Templeton Peck, Kitchener and I carefully worked our way through the menu choosing the tastiest and most interesting cuts, in reality we simply pointed at the most expensive cuts on the menu – the exchange rate was definitely in our favour. 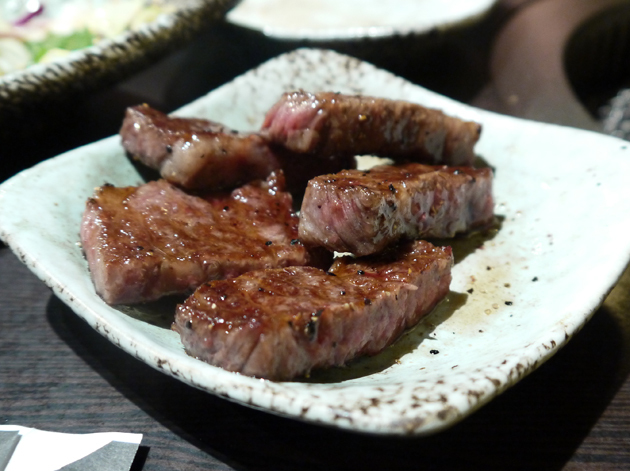 All of the cuts of beef were marbled with fat and incredibly tender. Cooked medium-medium rare they were all succulent and melted in the mouth. I lost track of which cuts were which but some had an almost honey-like sweetness to them while others had a soy sauce-like salty tinge to them. The accompanying rice wasn’t an afterthought and was suitably soft and fluffy – a stark contrast to the left-over, reheated glump I’ve had in other, less reputable places back home. 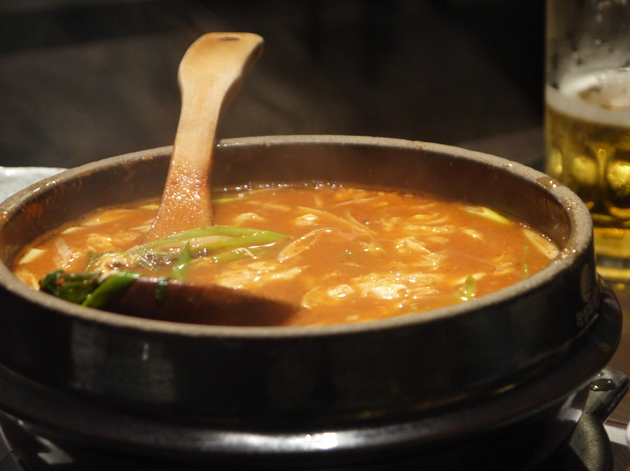 Despite the hot and humid weather we were all tempted by a bubbling cauldron of spicy tofu soup which seemed more Korean than Japanese to me. The tangy, fermented mildly spicy taste was mildly reminiscent of Sichuanese food. It’s not suitable for vegetarians though since bits of minced chicken are scattered throughout, although vegetarians are unlikely to make their way to a barbecue restaurant anyway. 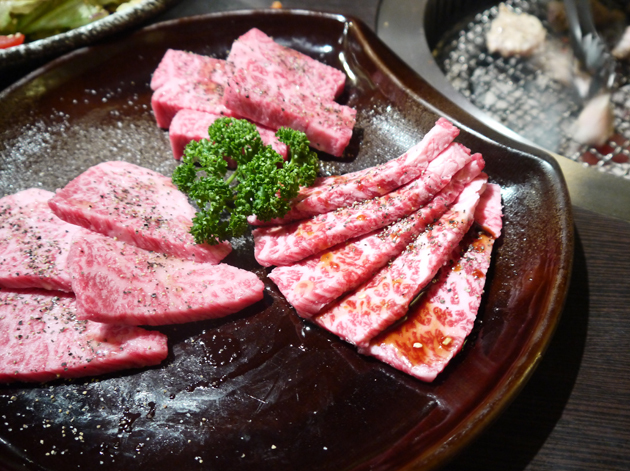 If you’re a carnivore and find yourself in Taipei, then it’s well worth seeking out Moe Yakiniku. Skip the chicken and the pork though and gorge on beef. Opening Hours: Monday-Friday 17.00-23.00 (last orders 22.30). Saturday-Sunday 14.00-23.00 (last orders 22.30). Tags: barbecue, bbq, beef, chicken, kimchee, kimchi, pork, restaurant, review, salad, seaweed, soup, steak, taipei, taiwan, tofu. Bookmark the permalink.